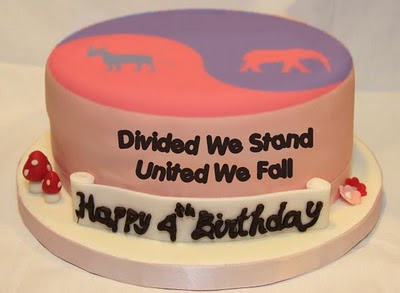 Welcome to the 37th edition of the Carnival of Divided Government - The Special Four Year Blogiversary Edition. Four years ago, I started this blog by asking the question "Is this blog for you? ", then offering the answer "Probably not." Well, I got that part right. 380 posts and 400,000 words later, uncountable throngs of blog readers reached the same conclusion and have flocked from this blog. In the meantime, the country has moved from disastrous Single Party Republican Rule to disastrous Single Party Democratic Rule. I think the country has a a collective learning disability. Nevertheless, we shoulder on - pushing that divided government rock up the mountain every election cycle. A blogiversary is a time for reflection. Looking back on my first three posts from April, 2006 I take a certain perverse pride in offering a coherent and consistent thematic content from then until now. 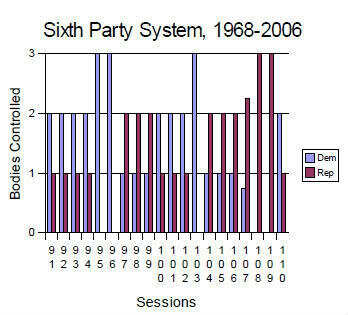 Then, we were advocating a straight Democratic vote in the 2006 mid-terms in order to break the hegemony and consequent bad governance of Single Party Republican Rule. Four years and two elections later, it's deja vu all over again. Now we are advocating a straight Republican vote in the 2010 mid-terms to break the hegemony and consequent bad governance of Single Party Democratic Rule. With a little luck, we'll have a similar result in 2010. A blogiversary is also a time for presents. We like presents. It has been a while since we've spruced the place up. Since Blogger is finally getting around to updating their templates, we are giving ourselves a blog makeover for our birthday. Look for changes over the next few days or weeks. We've also giving ourself Twitter and Facebook accounts. We will be introducing them into our blogging process, just as soon a we figure out WTF to do with them. Everybody tells us we need then, so we must need them, but we really don't know why. For right now, we are content to see how many twitter followers we can accumulate without ever sending a single tweet. As explained in earlier editions, we have adopted Latin ordinal numeration to impart a patina of gravitas reflecting the historical importance of the series. In this the Carnival of Divided Government Triginta Septendecim (XXXVII), as in all of the CODGOV editions, we select volunteers and draftees from the blogosphere and main stream media writing on the single topic of government divided between the major parties (leaving it to the reader to sort out volunteers from draftees). Consistent with this topic, the primary criteria for acceptance in the carnival is to explicitly use the words and/or concept of "divided government" in submitted posts. A criteria that, to our endless befuddlement, is ignored by many of the bloggers submitting posts, which sadly results in DWSUWF reluctantly ignoring their fine submissions. "There are two arguments supporting the notion that the president might benefit from divided government. First, a GOP-controlled House would provide Obama with a foil. Republicans would have some governing responsibility; Democrats wouldn't "own" Washington and automatically get the blame for everything that does or doesn't happen. A strong case can be made that President Clinton would not have been re-elected in 1996 had Democrats not lost control of Congress in 1994." I find it interesting that many Democrats are already looking past the probable train wreck of the mid-terms to the 2012 election. Understandable. Best to just look away. "First, historically the most stable governing coalition has strangely enough been divided government. If the GOP wins one or both chambers of Congress in 2010, a vote for Obama could thus become a vote to retain divided government. In that case, advantage Obama. " Agreed. I have been saying he will probably be re-elected since the presidential election. I did not vote for Barack Obama in 2008, but I look forward with the HOPE™ that I can be an enthusiastic supporter of his re-election in 2010. All it will take to make me a kool-aid swilling Obamite is a Republican majority in firm control of Congress.
" ...suburbanites are shifting again. As a result, many of these districts could swing back to the GOP, providing more than half of the forty seats Republicans need to capture the majority in the House. The battle for the suburbs will determine if President Barack Obama continues to work with his own party as the congressional majority or if Washington reverts to divided government. ...independent suburban voters prefer divided government. After six years of George Bush in the White House and a GOP congressional majority, many wanted a change. In 2006, Democrats won the House majority in part through a strong performance in the suburbs. " I like the analysis, but - it is hard to believe that the GOP could crawl out of the deep hole they dug for themselves in just one election cycle. Stay tuned. The meaning, character and importance of the Tea Party movement is a hot topic on both sides of the partisan divide (although Dems seem more interested in competing on who can find the most creatively self-contradictory rationale for ignoring the Tea Party). "I’m not frightened of the Tea Party movement (which is not especially old.) In fact, I hope it helps deliver divided government by helping Republicans win a bunch of seats. I just don’t think it’s very substantively libertarian. It is a populist movement centered on a certain conservative conception of traditional American identity. Libertarian rhetoric is definitely part of that, but rhetoric is rhetoric." 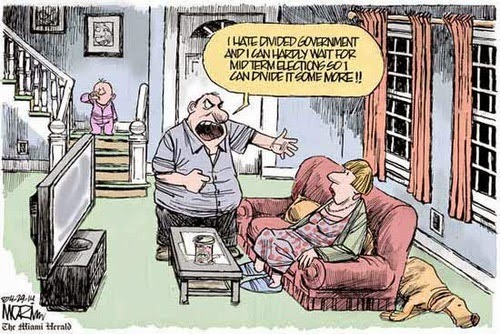 As good and succinct a description of the Tea Party as I've seen. "In 2012 will Mitt Romney do for climate change what he did for health care in Massachusetts? Will Michael Steele shape a policy vision for the future? Is Sarah Palin going to issue a plan for American resurgence shaped by the newly hired editorial staff of the Weekly Standard? Perhaps there is something better than these nightmare scenarios to anticipate, but I confess that I don’t know what it could be other than the divided government I already want." I don't disagree, but can only remind Mr. Friedersdorf that the divided government that he (and I) "already want", does not actually exist right now to our country's great loss. If we do get there in 2010, I'll be perfectly happy with a re-elected Barack Obama in 2012 - just in case the conservatives are not deemed to be sufficiently intellectually buff to suit Conor and Megan. 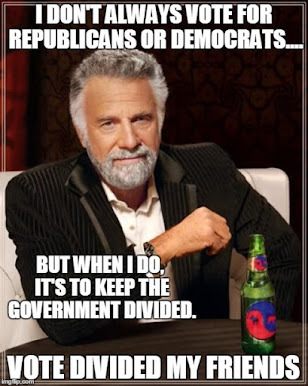 "...the only way to achieve sustainable bipartisanship is to divide control of the government, forcing the parties to negotiate in order to get anything done. That pulls policy toward the center, which encourages reasonableness. And the very fact that both parties sign off on any given policy makes the public perceive that policy as more reasonable, which makes it less controversial and more sustainable. I think a bipartisan health-care reform would have been only, say, 30 percent different from the one the Democrats passed, but it would have been 50 percent better (many of the Republicans’ ideas were good) and 200 percent more popular, which would have made it 80 percent more likely to succeed. " "The US is going to need higher taxes (as Jonathan himself has argued). I think the Democrats are more likely to raise taxes if they retain their Congressional majorities than if they have to share power with Republicans." Really Clive? We need One Party Democratic Rule in order to raise taxes? Really? Note to self: Pick up John Sample's new book. And find a place in the sidebar for this podcast. "Assuming that there is a divided government again in 2011, what might it do to solve economic problems? It is clear to most observers that current deficits are too high. There is no appetite in either party for major spending reductions, although a bi-partisan compromise might be reached on raising the retirement age, cutting defense spending (assuming geopolitical problems don't blow up) and a few other items. The real area for compromise, however, might be taxes." I like the assumption. Not so sure about the prescription. Still - an interesting proposition. "Our current political mindset is dominated by the Sixth Party System, which is unlike any other in US history--it's the only one in which divided government is the norm. And divided government perfectly suits elite interests, by empowering backroom dealing and consigning electoral pressure to a minimum. ...Therefore, our primary goal should be to do everything we can to intensify, prolong, and build upon this recent shift--which also happens to coincide with pressuring Democrats to take increasingly populist progressive stands. And that, in turn, coincides with supporting progressive primary challenges that can help to shift the balance of forces with the Democratic Party, as well as shifting the political narratives in our country as a whole. " Wow. 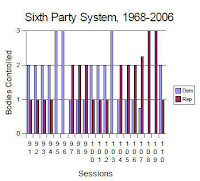 First he cherry picks the dates of the "Sixth Party System" to dilute and disguise the simple fact that divided government has dominated the US political environment in the modern era (since WWII). Then he argues that the spectacular game changing success and the -one week - one point - shift in the polls is a call to action for pressing the progressive "advantage" with another lurch further left. I was going to say that this is an example of wishful thinking - but, - that really does not cover it does it? I don't even think the word "delusional" adequately describes this analysis. Let's go with "batshit insane". I guess this is an example of what Lakoff calls "framing". Avlon's recommendation for the top Democrat: changing voters' minds. "Fundamentally, he [Obama] has got to get serious about the deficit," he said. "That's a lot of what this is all about -- independents' desire for checks and balances and divided government. ... There's nothing Democrats can do about that at this point."" Yup. Smells like - reality. We will continue to pick up the Carnival pace in this election year as divided government content is on the increase. Look for the next edition of The Carnival of Divided Government Triginta duodêvîgintî (XXXVIII)- Special Memorial Day Edition on or about 5-31-2010. Submit your blog article at carnival of divided government using our carnival submission form. Thanks for including my post against Obamacare in this carnival. I hope to be back again. Thanks for the submission,. I appreciate your humor and perspective. I am hoping to see an endorsement of the divided government voting heuristic on your blog, so that I may include you into the yet-to-be-posted 2010 Coalition of the Divided. If you fall when under united government, how has Switzerland fared so well?